^ 3.0 3.1 唐德剛. 晚清七十年: 甲午戰爭與戊戌變法. 遠流出版. 1998年. ^ 5.0 5.1 5.2 5.3 David C. Evans; Mark R. Peattie（英语：Mark Peattie）. Kaigun: Strategy, Tactics, and Technology in the Imperial Japanese Navy, 1887-1941. Naval Institute Press. 1997. ISBN 978-0-87021-192-8. ^ Chapter Ten: Geo-Political Conflict from the First Sino-Japanese War to the Washington Conference, 1894-1921 （英语）. ^ 8.0 8.1 James Allan. Under the Dragon Flag: My Experiences in the Chino-Japanese War. W. Heinemann. 1898年: 27–28頁. ^ 9.0 9.1 Philo Norton McGiffin. The Battle of the Yalu. The Century Illustrated Monthly Magazine. Vol. 50 (Century Company). 1895年. ^ 倪乐雄. 从甲午海战看战术火力的决定意义. 文汇报. 2010-10-09 [2013-04-06]. ^ 馬幼垣. 靖海澄疆：中國近代海軍史事新詮. 聯經出版事業. 2009年: 80. ISBN 978-957-08-3418-5. ^ 鈕先鍾. 中國歷史中的決定性會戰. 麥田出版. 2001年: 364. ISBN 9789574694396. Paine, S.C.M. The Sino-Japanese War of 1894–1895: Perceptions, Power, and Primacy. London: Cambridge University Press. 2002. ISBN 0-521-81714-5. Wright, Richard N. J. 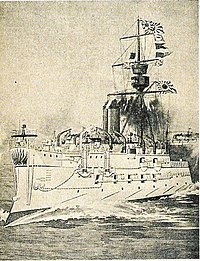 The Chinese Steam Navy 1862-1945. London: Chatham Publishing. 2000. ISBN 1-86176-144-9. Battle of the Yalu: All-Steel Warship - Dr. Terry Beckenbaugh, YouTube video of a lecture at the Dole Institute of Politics.